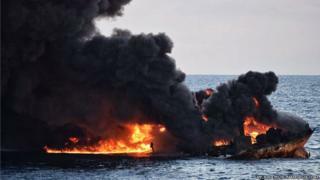 Fishing activities continued at the site of massive oil spill in the East China Sea for days after the incident, a BBC investigation suggests. Most of the fishing vessels in the affected region were identified as Chinese. Independent experts say fishing was stopped much later and reports in the Chinese media indicate the same. There have been major concerns over possible contamination in seafood and marine life in and around the region. The BBC obtained satellite images and data showing the presence of fishing boats in the area following the event. The spill occurred after an oil tanker collided with another cargo ship on January 6 before sinking more than a week later. It was transporting 136,000 tonnes or almost one million barrels of ultra-light crude oil, known as condensate, to South Korea. Experts say it is the first time petroleum product of this type has spilled in such huge quantity. It is feared to be highly toxic and is invisible unlike the shimmering slick on sea surface seen after crude-oil leaks. The Chinese state oceanic administration did not respond to our repeated requests for comment on fishing activities. According to the agriculture ministry website, an area of 30 nautical miles radius from the accident site was declared as a prohibited zone after the accident. “Based on our analysis, we estimate fishing activities to have likely continued in the area since the incident occurred, including within 60 nautical miles of the sinking site,” Brad Soule, chief analyst with OceanMind, a not-for-profit organisation specialising in tracking fishing activities told the BBC. The group’s analysis estimates that there were more than 400 fishing vessels operating within the region between January 6 and 25 while 13 were detected within 60 nautical miles of the sinking site. Sanchi, the tanker carrying the oil from Iran, is believed to have drifted between 50 to 100 nautical miles south after the collision before it sank. This could mean that it continued spilling the condensate all along the way before it went down. China’s Ministry of Transport said that a salvage team had located the sunken vessel at a depth of 115m (377ft). “Between January 26 and February 14, 146 observed fishing vessels were active in the region and two observed fishing vessels active within 60 nautical miles of the sinking site,” OceanMind said in its analysis. Mr Soule said the analysis was based on transmissions received from only fishing vessels which were travelling at speeds that are associated with fishing activity, slower than typical travelling speeds. The vessels carry communications devices called transponders that send radio signals identifying themselves. “Fishing had continued in the area potentially polluted by the Sanchi spill, and the Chinese government didn’t close fisheries until very recently,” said Professor Richard Steiner, a noted marine scientist who has helped governments with his oil-spill management expertise in the past. In an email to the Chinese government after the Sanchi spill, he had suggested: You should immediately close all fisheries in the region of the spill, as you do not want any contaminated fishery products entering the consumer market. The findings of the Global Fishing Watch, another international organisation monitoring fishing vessels, are also similar. “We looked at fishing activity detected by GFW as measured in hours of activity, after the Sanchi collision happened on 6 January, and compared to the same time period the previous year,” Paul Woods of the GFW told the BBC. According to China’s state-run media, Xinhua, the government’s move to keep fishing vessels away came two days after Sanchi sank – that was 10 days after the collision. “The Shanghai marine search and rescue centre dispatched 13 vessels on Tuesday (January 16) to tackle follow-up issues, maintain order at the site, evacuate nearby merchant and fishing ships, and issue navigational warnings in both Chinese and English,” it reported on 17 January. International oil spill experts say that intervention was too slow. “Going by the pictures we saw, a lot of condensate had already started spilling from the Sanchi soon after it collided with another ship,” said Prof Steiner. “If we had a 1 knot current over the site for eight days, then pollution from the event could conceivably have travelled in the subsurface plume as far as 200 miles away, downstream,” he said in the email to China’s State Oceanic Administration. The New York Times has reported that officials in Beijing announced on 1 February that samples of fish taken within four to five nautical miles of the sunken ship contained traces of petroleum hydrocarbons, suggesting possible condensate contamination. “In any spill event, fuel oil will produce damage on the shore, whilst light oil like kerosene and petrol will have much more impact on marine species because of the persistence in water column,” said Dr Corina Ciocan, a marine biologist with University of Brighton. Experts say the closure of fisheries is one of the first steps authorities take after major oil spills. “This was something done immediately after the Deep Water Horizon oil spill incident in 2010,” said Chris Reddy, a senior scientist with Woods Hole Oceanographic Institution in the US. Mr Reddy however believes the oil spill in East China Sea will be killing sea creatures as an immediate effect but there is no long term seafood contamination risk. “That is because the condensate spilled will soon be diluted by cleaner seawater, eaten by microbes, or evaporate which means there will be no concentration of chemicals threatening to contaminate the seafood,” he said. The Food and Agriculture Organization (FAO) of the UN did not make any comment when asked whether seafood from the impacted region could already be reaching consumer markets.